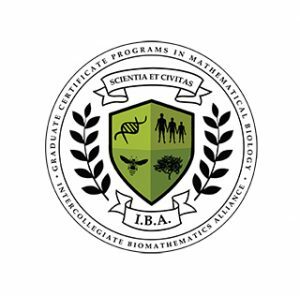 Seal for the Intercollegiate Biomathematics Alliance Graduate Certificate Programs in Mathematical Biology. Those who study a new field that combines mathematics and biology are getting a new way to develop biomathematics competency. The Intercollegiate Biomathematics Alliance (IBA) is offering certificate programs geared toward students who are deciding on graduate school or professionals who want to expand their credentials. Combining the fields of mathematical modeling, data analysis, computer science, and biological sciences, IBA’s Graduate Certificate Programs in Mathematical Biology is the first flexible, graduate curriculum in mathematical biology, also known as biomathematics. “There’s really nothing else like this out there,” said Olcay Akman, director of the IBA and professor of mathematics at Illinois State University, which is IBA’s home base. “Because the field is so new, no one department or university has the resources to launch a full biomathematics certificate,” said Akman. The revolutionary science is being used from everything to predicting how a disease will spread to estimating the declining population of butterflies, but Akman noted many institutions struggle to find funding for new initiatives. In response, the IBA allows faculty from across the nation to combine forces. “IBA is a collective of prestigious national universities and colleges that are at the forefront of catapulting biomathematics onto the international stage,” said Akman. The consortium includes 10 institutions that share faculty, resources, and research and development. Students attending any of the IBA-member schools can take advantage of experts, equipment, software, and classes from across the consortium. “A biology student in Portland can take a class in real time on modeling that is held at Illinois State. Students in Illinois working on math predictions can talk to an expert in Alaska about analyses,” he added. The third approach, known as the accelerated option, is geared toward recent graduates wishing to begin taking biomathematics courses toward a graduate degree. Students who choose the third option will have preference in graduate admissions at Illinois State. A listing of all IBA courses from all 10 institutions is available at the IBA website, along with more information about the certificate. Those interested can also email Akman at biomath@ilstu.edu.